apply online for this Raichur District VA recruitment 2019. 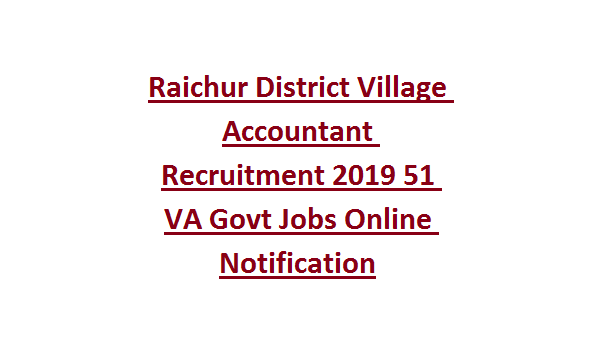 Official website to apply online for this Raichur District recruitment of Village Accountant recruitment 2019 is http://raichur-va.kar.nic.in. 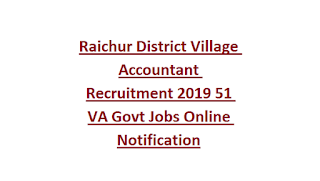 Last date to submission of application form online is 22-02-2019 for this Raichur District VA recruitment 2019. Candidates selection will be based on merit in 12th Class marks only for this Village Accountant Recruitment Raichur Revenue Department. There are total 51 vacancies are in this VA recruitment of Raichur District revenue dept. As on 22-02-2019 candidates age limits are 18-35 years for Cat 1, SC, ST candidates age limits are 18-40 years and for others 18-40 years. 10+2 or 12th class ICSE or CBSE they are eligible to apply online for this VA Posts in Raichur District. Candidates will be shortlisted on basis of merit in 12th class marks, community wise and certificate verification. Online applications only accepted for this Raichur District VA posts through official website of http://raichur-va.kar.nic.in. Closing date of online form is 22-02-2019.